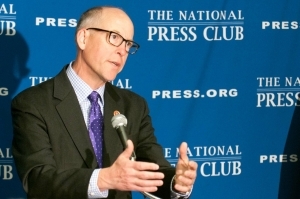 U.S. Representative Greg Walden discusses his party's plans for the 2014 congressional elections at a NPC Newsmaker, March 11, 2014. Even with his optimism, Walden said he expects tough campaigns. “Given redistricting and the way the battlefield is locked in and smaller, it will be more intense, but there are really fewer seats in play,” he said. Walden estimated that 30 to 40 seats will be in play. He also cited political analyst Charlie Cook’s assessment, according to which there are 15 seats in play, with 11 on the Democratic side and four on the Republican side. Given these different evaluations, Walden admitted he does not know how the election will turn out. “In 2010, who saw 63 net [Republican] seats coming our way,” he said at the Newsmaker event. “I think we are on the cusp of a referendum election year much like '06, except this time the Democrats are the ones in which the referral will take place,” he added. President Barack Obama’s favorability numbers are in the “tank” nationwide and “especially in the targeted seats that will be in play in the House,” Walden said. He mentioned the results of a GOP poll in West Virginia’s District 3, which showed Republican Evan Jenkins leads the incumbent Democrat Nick Rahall by 14 percentage points, 54 to 40. Rahall was first elected to Congress in 1976. District 3 is considered to be the second most conservative district represented by a Democrat. The district favored Mitt Romney 66-32 percent in the 2010 presidential election, and Walden indicated he is optimistic about Jenkins' chances. The most conservative district held by a Democrat is Utah’s 4th, represented by retiring congressman Jim Matheson, who has served since 2001. Walden said both Rahall and Matheson are in “red zone” districts, seven districts that have voted for Republicans in the last few presidential elections but have Democratic representatives. As for issues, Walden repeated the political proverb that “all politics is local.” He said that the Rahall-Jenkins race is in coal country, and one tactic in these areas is to say that Obama is waging a “war on coal,” he said. At the national level, Walden said he thinks that the economy, jobs, and Obamacare will be important in many congressional races.